Students host a 2 hour talk show focused on Long Island life, national news, and international issues. Students research topics, book guests, and engage in deep discussions. The hosts present / disucss hard news, create / air feature packages and interview many local / national newsmakers. Politics, culture, technology, entertinment, the economy, and many other topics are covered. Story / topic ideas can be suggested by emailing programming[at]wrhu.org. 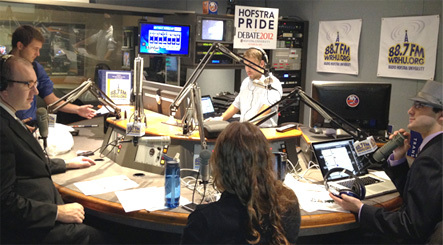 Hofstra Morning Wake Up Call is the only morning drive long form news / talk show in a major market where young people express informed opinions about local, national, and international issues. super model Heidi Klum at an event in New York City.